Gender parity has real-life implications for the health of women and girls. Burnet Institute is proud to support International Women’s Day (IWD), a time to reflect, celebrate and promote the achievements of women in science, public health, research, the communities we serve and the issues all women face. Each year the Women of Burnet celebrate International Women’s Day and highlight some of the key issues and challenges facing women. Burnet’s Young People’s Health research group is tackling the many challenges facing young women in Australia - health, empowerment and opportunity. 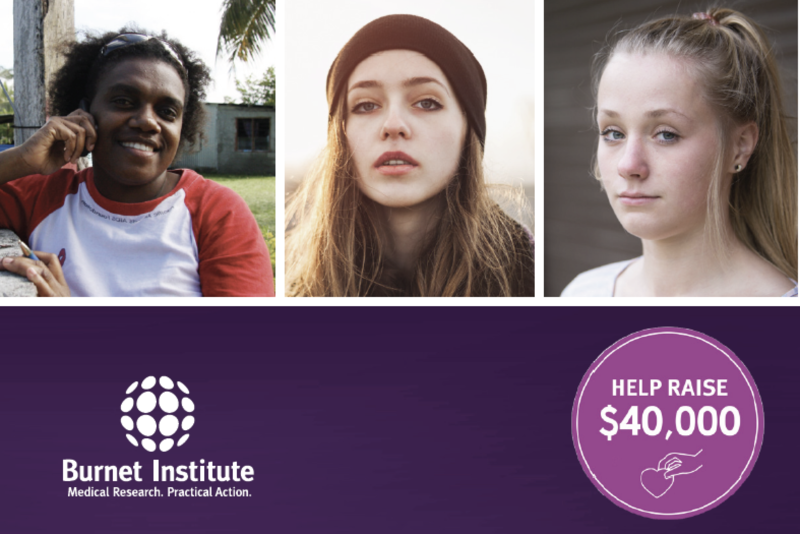 Our ‘Investing in Vulnerable Young Women’ campaign in 2019 is aiming to raise $40,000 to progress our research projects addressing these issues in Australia. The importance of health, empowerment and opportunity lies at the heart of our campaign. Inequality and the lack of opportunity for many women in developed and developing nations can have an adverse affect on their health, wellbeing and quality of life. International Women’s Day is also a time to reflect on the achievements and contributions of women all over the world. Whether they be global, on a national level, or within their communities. Events are held by women’s networks, corporations, charities, educational institutions, government bodies, political parties, the media and amongst communities. Started by the Suffragettes in the early 1900’s, the first International Women’s Day was celebrated in 1911.